Persona Island Resort, located in the village of Tekek, is a basic but charming family-run cluster of rooms, all of which a mere stone's throw from a stunning stretch of Tekek beach. We've stayed here a few times now and there are a few reasons we like it. 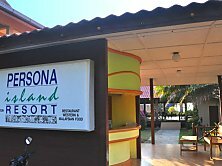 First of all is the Tioman-flavored service that you get at Persona Island Resort. 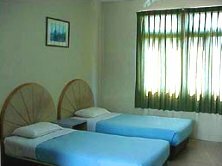 The resort's owners are directly related to Nazri's Place, which was the first ever to offer rooms in Tioman for the traveling public. 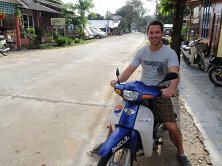 This lineage shows in the way customers are treated here; everyone, whether young or old, local or foreign, truly everyone receives a hefty dose of laid-back Tioman hospitality. We've brought in friends from far and wide and all agree with us: Persona Island Resort is laid-back personified (pun intended). Second, Persona Island Resort, being a budget category resort, its rooms are pretty basic in set-up and cheap. They come in 2-bedders or 3-bedders and all offer air-con and a separate bathroom with shower. Mind you, the rooms are all comparatively big when compared with most of the surrounding resorts and hotels. We also like the way our rooms are tidied up by the friendly Persona Island Resort staff. Check the Persona Island Resort room rates with Agoda. You can book now and pay later. Persona Island Resort offers a spacious open-air eating area, which we enjoy. But you can also opt to eat your meals inside the restaurant just next to the main Persona Island Resort building. All meals are prepared in-house and are great and good value for money. That said, there are quite a few eateries peppered around Persona Island Resort, so if you're keen to try different kinds of meals, then make sure you try some of the surrounding "makan" places. Sarang, for instance, the restaurant along the main road, has an awesome sweet and sour chicken and we found next-door neighbor Babura's nasi goreng simply to die for. What else does Persona Island Resort offer? We noticed that the rooms are quite frequently taken by groups, mostly companies on retreats or doing motivational courses. So if you're looking for group accommodation, look no further, because I think you'll find it in Persona Island Resort. Also, given Persona Island Resort's close proximity to the beach, it will come as no surprise that they offer complete snorkeling and scuba-diving packages. Tips: If you just want a roof over your head whilst you go on a scuba-diving safari in Tioman, then Persona Island Resort will do just nicely, because it offers three scuba-dive outfits pretty much right next door to it. If you're not quite that intrepid, but you would like to try your hand at snorkeling, then this, too, is available at these outfits. We like snorkelling along the nearby beach and around Renggis, which is just a short boat ride towards Berjaya. Lastly, the Persona Island Resort rooms are generally fully booked quite far ahead by groups, so book early if you're trying to secure a room.